When any large initiatives are launched, especially by the Government, there are always people who are “for” or “against” it. Aadhar Unique Identification project (UID) is one such project that has been in the news for few years now. While there are millions who think that Aadhar will benefit the citizens of India in many ways and bring down corruption to large extent, there are many who have severely criticized Aadhar project. Mathew Thomas, a former defense scientist and a civic activist is one such critic of Aadhar UID project. 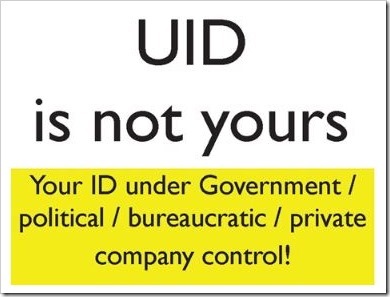 He has recently published a monograph called “UID is not yours”, in which he has termed the entire UID project as Sinister Ploy by the Government and has equated it to being an Ultimate Identification Theft. “UID is not yours” presents various perspectives of those who have examined UID, through their articles. The monograph also includes a few RTI queries and UIDAI’s replies, to present first hand information about the project. It also includes material collated from the Internet to call attention to the need to halt the scheme and investigate it further. 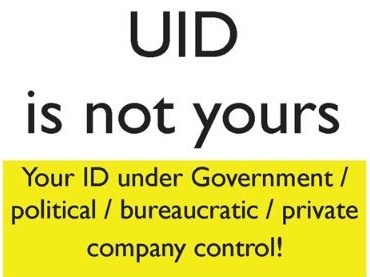 In very short, “UID is not yours” is trying to convey that UID is a extremely risky, unsecure and dangerous proposition as the control of the database of UID ultimately lies with the Government, meaning some politician, bureaucrat or company official who manages the database. And if there are any “leakages” at that level, it very well cause damages in catastrophic proportions for entire country and its citizens. Here is the entire monograph – It surely has some interesting information. If you are yet to apply for UID, make sure you read this, you may probably cancel your plans to get a UID for yourself! On a personal level, I think Aadhar UID is a great project and will help millions of Indians, especially rural, in times to come. With Nandan Nilekani at the helm, I am sure most of the “security” aspects have been thought over. It is the same in the US with Social Security Numbers. And, though possibilities of ID thefts, hacks etc cannot be ruled out, I don’t think one can stop a project of this magnitude. Would love to hear your opinion on this! Aadhar Card, Now Mandatory for School Students? Can u give a normal link to the pdf ? It’s difficult to scroll in the current form in the site. Dear Santosh – Here is the link to the pdf file – http://woot.in/X9EDHO . Hope that helps..
1. The most sensitive and unique identity of a human are biometrics signature which is a part of UID. There is a great privacy concerns which need to be resolved. What if my biometric information is leaked. How can I change myself? 2. The most dangerous part, the database will be in controlled of private IT sector like Infosys. Who will gurantee that they will not abuse the most sensitive and valuable assests of Indian citizens. 3. UID scheme is already invested hell lot of money and so far no relevant results. A corporate-political corruption will be visible soon. 4. And I lost trust on the people (bureaucrats, politicians and ministers) sitting and managing these schemes. These questions technical or anecdotal reason are based on my research in IT Security and Privacy. Hey Ankit – Yes, your concerns are not only valid, but do have lot of weight as well. And that’s exactly the point of the monograph published. Having said that, what the UADAI needs to do is clarify how they are going to protect the security. For project of this magnitude, obviously security concerns will be there… but I have faith in Mr. Nilekani and on a personal level, I really want AAdhar to succeed – Can can impact the economy immeasurably. Yes, indeed, successful implementation of Aadhar card will be boon to India but just now I found that Aadhar card was issued to illigal Bangladeshi immigrants and possible anti-India people.